What is the net worth of your life?- It is a serious question that requires attention of all of you. Before digging the roots, it�s better to get a deep insight into the issue. Honor Killing is a global issue in which family members kill the girl for marring or having relationships with a man belonging to other caste, same gotra or other nationality. In India, it is very common in Punjab, especially, Haryana, but cases related with honor killing is very common in middle east, U.S.A, Egypt, and many other countries. Women belong to different countries are facing this discrimination since long and demanding their rights of choosing a partner of own choice. Don�t get confused and take honor killing identical to domestic violence. The motive of honor killing is entirely different from psychopathic homicides, serial killings, crimes of passion, revenge killings, domestic violence or any other genre of killings as it is based on behavior that typify some cultures, often reinforced by fundamentalist religious dictates. The girl you raised in the safe arms of father and brother, one day brutally killed by them only just as an outcome of vengeance. I do understand that when it comes to saving pride, a family, especially male cannot tolerate anything that dishonors the family, but my question here is- is it the right way to show the anger? Most of the couples tie the knot to spend the rest of their lives together; it is not like they found engaged doing any shameful act. Even if you disagree here, but killing is not an option to save the honor, it is simply an act to save the false pride. One surprising fact here, such families are motivated and appreciated by high legal authorities. Let�s take a popular case of honor-killing- The Manoj-Babli honor killing case. The newly-weds Manoj Banwala and Babli were killed in June 2007 and the successive court case which is historically convicted defendants for an honor killing. Important point here is, the killing was ordered by a Khap Panchayat (a religious caste-based council), Haryana. The next popular honor killing case is- Noor Almaleki case. Noor, 20-year-old was living in Pheonix. She and her friend, 43-year-old Amal Khalaf were struck by a car driven by Noor�s father. While Amal survived, Noor later died. Noor�s father, Fateh-al-Maleki later convicted of killing his daughter. 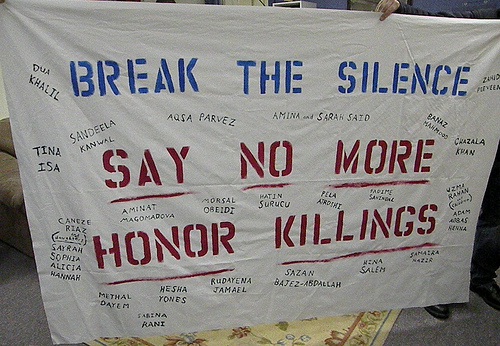 Honor Killing cases should be a point of concern for the whole world, be it U.S.A, Middle East, Pakistan, Japan or India. After killing their own child or sibling, you�ll not find a single sign of sorrow on their faces; even they are highly appreciated for sacrificing their own blood for saving family honor. I don�t know such people will understand that every life has a value and a purpose. You�re no one to take it. Killing should not be the option to show your anger. Life is a precious gift, and we all should respect it.